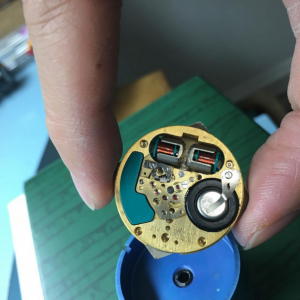 Service for your Bulova Accutron timepiece includes cleaning, relubrication, regulation of balance, case and bracelet refinishing (if applicable), replacement of seals and gaskets and water resistance testing (if applicable), and an 18 month warranty. Our Swiss trained watchmakers are trained to repair most to all models of Bulova Accutron watches. 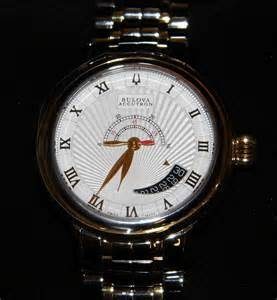 Please allow two to three weeks for completion of a typical Bulova and Accutron service/overhaul. Some models may require 4-6 weeks due to complications or backordered parts. 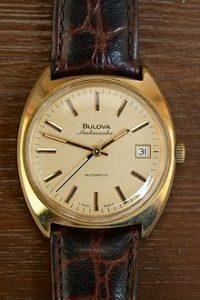 Note that most Bulova Accutron timepieces are discontinued and movement parts and modules may be in limited supply. We service most to all models of Bulova Accutron watches including Bulova Marine Star, Banker, Broadcaster, Cavalier, Clipper, Concerto, Oceanographer, Sea King, Spinnaker, Candlelight C, First Lady, Ambassador, Accutron Spaceview, Railroad, Deep Sea, Day & Date, Day Q, and all chronograph models. Our Bulova Accutron watchmakers are trained in the servicing and overhauls of most models of Bulova and Accutron watches. We only use genuine Bulova and Accutron parts if the timepiece requires it.